The Earls of East Hall, Part I – Tell my story. This week, I’m putting together the section of the book about Emmett’s life as a law school student, at Stetson University. Because I still don’t have a journal of Emmett’s, or, his scrapbooks (yet), I had to look at a lot of secondary sources to get an idea of what his life was like on campus in 1903. Life in East Hall must have been a lot of fun for Emmett and his friends. But, who were these friends of his, and, what became of them? More importantly, did Emmett remain friends with them beyond Stetson? Emile D. Anthony. Anthony earned a diploma in Bookkeeping from the Business College in 1903. Anthony’s family was prosperous and important; they were from West Palm Beach, listed as merchants in several U.S. Census reports. The Anthony family is still in business today. Emmett doesn’t seem to have been in contact with Emile much after college days; Emile also lived out of Emmett’s congressional district, so he wouldn’t have been able to vote for him. Paul Carter. You’ve met Paul in an earlier post. Paul was Emmett’s best friend from childhood; he was also one of the best student orators at Stetson during his tenure there. Mayor Paul Carter of Marianna, Florida. Source: The Pensacola Journal, 1912. Emmett and Paul drifted apart a bit. During the time when Emmett moved to Pensacola, and ran for Congress, Paul ran for mayor of Marianna (he held the office for four terms), settled down and got married to Mary Horne of Chipley. They remained friends, though, as Paul served as one of Emmett’s honorary pall bearers at his funeral. 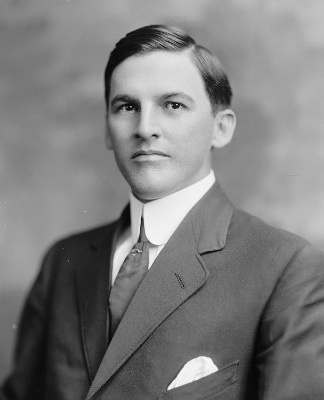 Walter B. Fulghum. Walter was originally from Richmond, Indiana, and was a combination Latin-Science major. Walter’s name shows up several times across different issues of The Stetson Collegiate, (mostly mentioned in the “Locals” section, which was a gossip column that ran for several pages) as attending parties at the women’s dorms, and the like. One interesting thing I discovered about Fulghum was that he was a Quaker in the White Water community of Indiana. I mention this because after following Emmett and his friends around for three years in research land, this was a group that liked booze-fueled parties. Maybe not every single party, but I’ve been able to establish that Emmett’s drinking career was established back when he was at West Florida Seminary in 1900. Quakers aren’t forbidden from consuming alcohol, but most abstain. Fulghum eventually became a merchant, then a farmer. Later in life, he had a farm in Caldwell, Texas; he died there in 1951 from arteriosclerosis. Fulghum probably did not see Emmett after Stetson, given that he moved back to Indiana right after graduation. Charles E. Pelot. Charles was originally from Manatee, Florida, and he was enrolled in Stetson’s Law School. I’ll continue with the rest of this study of Emmett’s roommates in a few days. Stay tuned! Pingback: The Earls of East Hall, Part II | Tell my story. Pingback: Spring Break at Ormond | Tell my story. Was curious about Walter B. Fulghum since I found an old leather satchel bearing his name in my grandmother’s house. Underneath his name it said San Marcos. That’s interesting! What was in the satchel, out of curiosity? I ask because an archivist in the Sterling, Illinois (where Emmett worked) historical socieety has a trunk that belonged to Emmett’s former law partner. I asked what was in the trunk (hoping it was old correspondence, or a journal), but he never replied back.